Speaking with Billboard, co-creator and co-executive producer Ben Winston and series executive producer and co-showrunner Eric Pankowski said "Karaoke" is more than a viral hit. 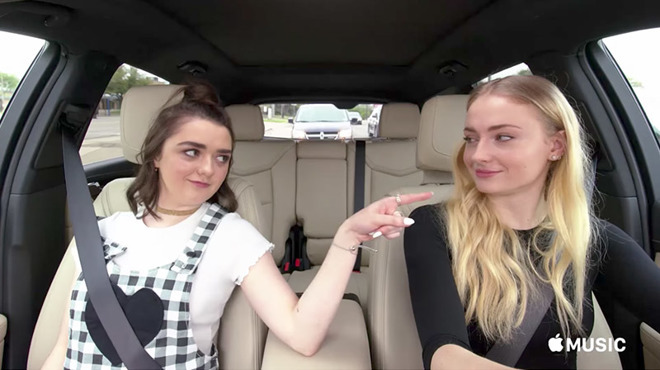 The segment, which first aired on The Late Late Show with James Corden in 2015, lets viewers see their favorite celebrities candidly talk — and sing — without being hindered by production teams, managers or even camera operators. "People talk about it being a viral hit, but the fundamental thing that makes it work is that it's really just a beautiful piece of television with two people having a chat and making each other laugh, singing songs, with none of the barriers we usually see on TV," Winston said. Born from a sketch Corden performed in 2011 on British television with George Michael, the idea later made its way to U.S. television with a short segment starring Mariah Carey. That clip did indeed go viral, generating 14 million hits on YouTube, an impressive number for a new late night show. The Carey segment has been viewed more than 30 million times. Recognizing the bit's potential, Corden and Winston enlisted Pankowski's help to turn the segment into a spin-off. Shopping the idea around, the group ultimately landed with Apple, which is looking to broaden its Apple Music content offering with new and original shows. "We met with Jimmy Iovine and Eddy Cue jimmy and they were so compelling in their vision for the show as a partner. And the greatest thing they said was, 'make a show as long as you think it should be.' So, some [episodes] are 12 minutes, some 16, some 20, whatever it takes to make it the best. That's the wonderful thing about working with Apple, they let us make the best show we can," Winston said. "Second, Apple represents so much about what is relevant and cool, and 'Carpool' is relevant and it's a cool brand people love. Apple has always been at the forefront of music and now Apple Music is doing things other streaming services aren't. They were an obvious partner, a match made in heaven." Apple's huge installed consumer base was a selling point for Pankowski, who said, "As a producer and someone who is responsible for entertaining people... there are 1.2 billion iOS devices in the world. That means our show is available for 1.2 billion people whenever they want it. It's incredible, it's inspiring and humbling." Unlike its TV counterpart, Corden will not host each "Karaoke" episode. Instead, celebrities drive around town singing and talking with each other, a free format producers hope will make the show relatable. Corden will appear in two episodes, the premiere with Will Smith and the finale with LeBron James. From film and TV stars to singers to professional athletes, "Karaoke" features an eclectic mix of guests. The show's variety and candid nature makes it special, Pankowski said. "It's a celebration of the joy of music. You see people singing the hits you love, big stars singing other people's songs — actors, comedians and athletes singing and rapping songs that mean something to them," Pankowski said. "You can tell [it's real] because you can't fake passion and when you see it it's infectious." "Carpool Karaoke" launches on Apple Music tomorrow with the Corden and Smith episode, which is to be followed by 19 more installments.